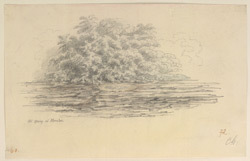 Watercolour in pen and ink of an oil spring at Minbu from 'A Series of Views in Burmah taken during Major Phayre’s Mission to the Court of Ava in 1855' by Colesworthy Grant. This album consists of 106 landscapes and portraits of Burmese and Europeans documenting the British embassy to the Burmese King, Mindon Min (r.1853-1878). The mission took place after the Second Anglo-Burmese War in 1852 and the annexation by the British of the Burmese province of Pegu. It was despatched by the Governor-General of India Lord Dalhousie on the instructions of the East India Company, to attempt to persuade King Mindon to sign a treaty formally acknowledging the extension of British rule over the province. The mission started out from Rangoon (Yangon) and travelled up the Irrawaddy (Ayeyarwady) River to the royal capital at Amarapura, stopping at various locations on the outward and return passages. While Linnaeus Tripe was the official photographer of the mission, Colesworthy Grant (1813-1880) was the official artist. In recognition of his skill, Grant was presented with a gold cup and ruby ring by the Burmese King. In addition to a privately-printed book of notes, a number of Grant's drawing were used for illustrations to Henry Yule’s ‘A Narrative of the mission sent by the Governor General of India to the Court of Ava in 1855’ published in 1858. Grant wrote that: 'Within about half a mile of the Mud volcanoes this petrolium spring was found. Its surface was level with the earth, and would hardly have attracted attention but for the bubbling in the centre, and the various colours of its oily coating...” Further north from the location of this spring were the well-known oil fields at Yenangyaung.